Sleep is NOT like money. You can't save up sleep ahead of time and you can't borrow it. But just like with money, you can go into debt with it. If you don't get enough sleep, you "owe" more sleep to yourself. This debt can only be paid back by sleeping. You can't overcome it with willpower, and it won't go away by itself. Sleep is an appetite. For food you eat, for water you drink, for sleep you just go to sleep. Sleep is an easy appetite for your body to satisfy. Most people lose sleep because they stay up too late or get up too early to give themselves a good night's rest. Many other people have sleep medical disorders that keep them from sleeping enough to feel rested. 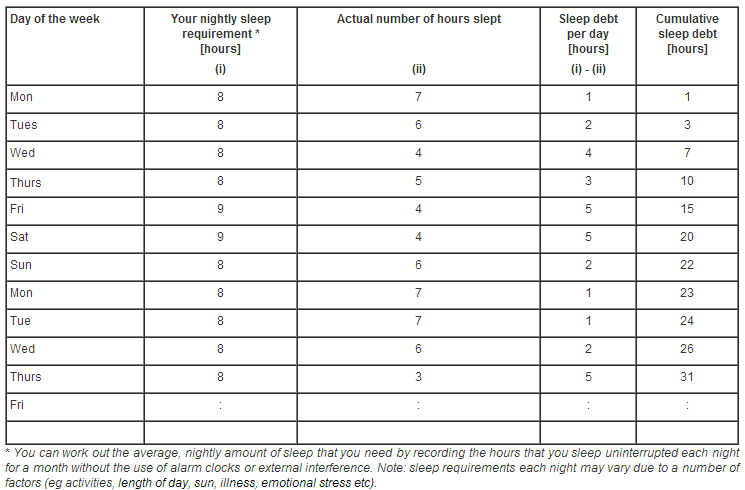 When your sleep debt gets big enough, there is nothing you can do that will keep you awake. You may feel awake because you are busy or excited, but as soon as you calm down your sleep debt takes over and your body goes to sleep. For example, some people feel awake when they are at a party, where there is a lot of stimulation, but as soon as they get behind the wheel of a car, the excitement wears off, the monotony of driving takes over and sleep overpowers them. The effects of sleep loss are cumulative, and regularly losing one or two hours of sleep a night can lead to chronic sleepiness over time. 'Sleep debt accumulates until it is paid back by sleeping'!